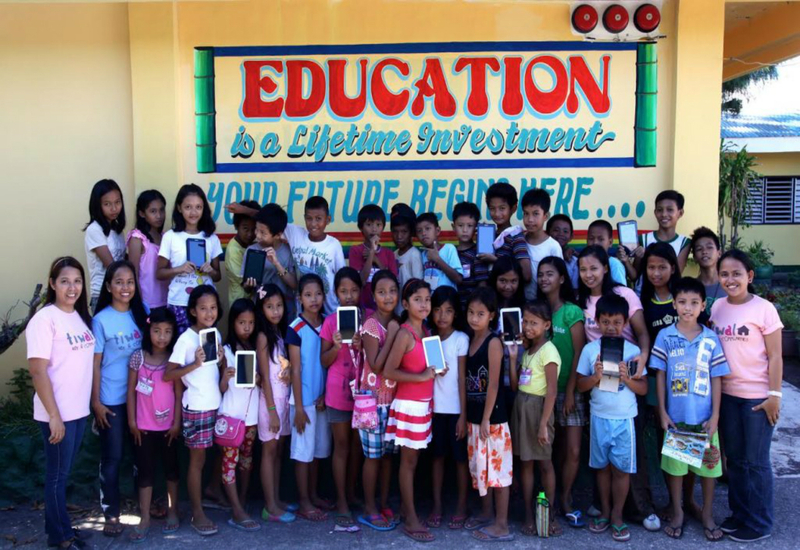 In 2014, we piloted a tablet education program with Tiwala Kids and Communities in the Philippines. Five tablets were pre-loaded with an educational application and workshops were conducted for the Tiwala teachers to learn how to use the tablets to improve their teaching. We discussed in our previous blog post that education can be transformed with tablet technology, reviewing both the benefits and challenges of implementing tablet education projects. Based on the results from our own project in the Philippines, we strongly believe that tablet education can be extremely successful in developing countries and rural communities when implemented properly. The tablet education program transformed education practices by providing teachers with new educational content. This notably broadened the children’s horizons by introducing them to new technology, visuals, and audio on the tablets. Now instead of teaching just through traditional methods, the students are able to play interactive literacy and numeracy games on tablets. The tablet education program also provided initial data analytics insight and showed a marked improvement in literacy and numeracy skills – there was a 30% class improvement. The Tiwala teachers provided feedback that the participating students improved in their reading, listening, and vocabulary. Students also found that they were able to solve math problems quicker. What’s more, the attendance rate improves, there was increased student engagement and higher motivation for children to come to school and learn. It wasn’t just the students who were excited about the tablets, both teachers and parents were thrilled about the new opportunities too. The teachers noted that their students had become more participative and that they were showing remarkable improvement in their written work, vocabulary skills and solving maths problems. Parents believe that their child’s exposure to technology may provide their children with a better future as they are more focused and engaged with their learning. With the success of the tablet education program with Tiwala, we will continue to expand both the program and our network of collaborative partners in other communities. While understanding that there are both benefits and challenges to implementing tablet education programs, we actively work towards designing appropriate solutions that are adapted to the particular situation and environments of those communities. This way we can mitigate the challenges that may arise. We hope to improve the quality of education so that underrepresented communities in developing countries and rural areas are able to access the new technology that is continuously emerging today.